Put my wellington boots on and find treasures in the woods. The sweet chestnuts that what I was after. Crunch, crunch... stamping the autumn leaves and going further in the woods to find the treasures. I'm so lucky to live near such a beautiful nature reserve and yet be so close to London. 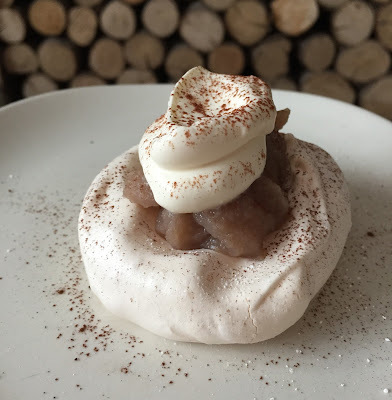 Once again, I managed to make the beautifully smooth chestnut puree and made "Petits Mont Blancs" Chestnut puree and cream on the Meringue nest. 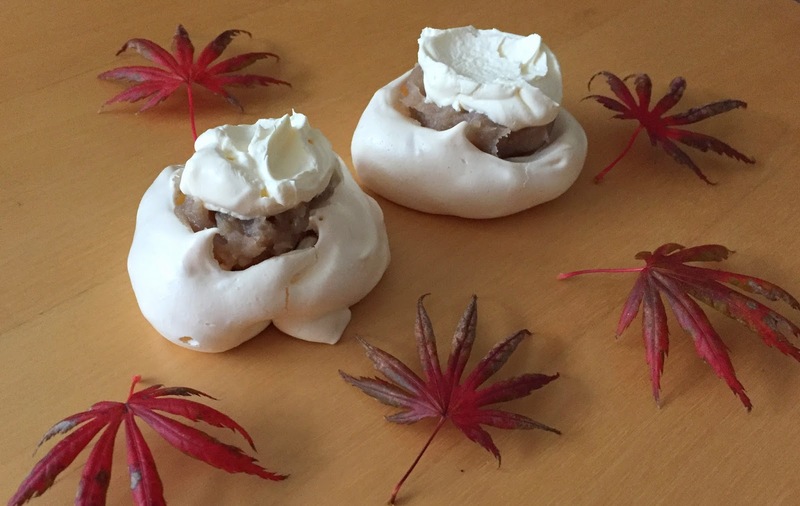 Chestnuts are very popular in savoury dishes in the UK, but you won't be disappointed with this sweet treat. Cut a cross in the chestnut shell. Pre-heat your oven to 200C and place a roasting dish or oven tray inside. Pop the chestnuts into a saucepan of water and bring it up to the boil. Once it is boiling, start your timer for 2 minutes. At the end of that time, drain the water off the chestnuts and tip the still steaming chestnuts onto the hot oven tray in the oven. Leave the chestnuts in the oven for 7 minutes. While the nuts are roasting, prepare a large bowl and put a tea towel inside the bowl. Toss the nuts inside the tea towel in the bowl. This will keep the nuts warm as you peel them. It’s easier to peel them when they are warm. Pull one nut out at a time from under the towel and pull the shell and fluffy inner skin away from the kernel. Keep going until you’re all done. If you are making puree, the shape of the chestnut doesn’t matter. So, use a teaspoon and scoop out the flesh. The hard work is done. Now the next bit is much easier. Chop the chestnuts roughly then place in a saucepan with sugar, vanilla and just enough water to cover the chestnuts. Bring to a simmer so that all the sugar dissolves and continue to heat for about 20 minutes. Remove the vanilla bean. 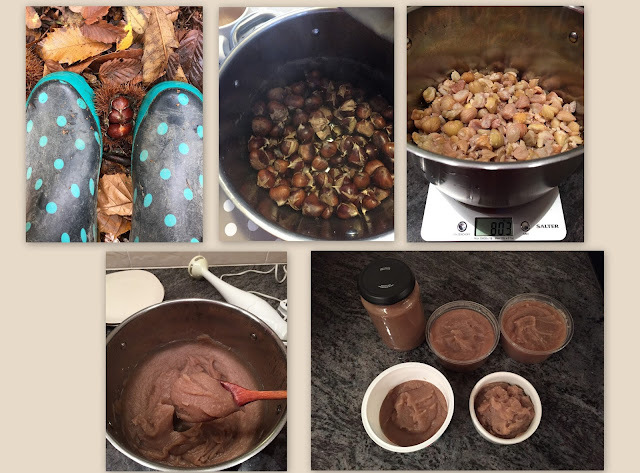 Blitz the chestnuts with a hand blender until they become a smooth paste. ** Please see my Easy Mini Meringue recipe for more meringues. Preheat the oven to 130°C, (fan 110°C). Using an 8cm (3 ¼ in) Mark out 9 circles on a baking parchment. Get a really clean medium sized bowl. If it is not spotlessly clean, it will mean that the egg whites don’t whip up properly. Tip the egg whites into the bowl, squeeze the lemon juice in and then whisk them to a medium peak. To test, lift the whisk out of the meringue with some of the white foam on the end. Next add a spoonful of the sugar to the meringue and whisk really hard until all of the sugar has ‘dissolved’ and the mixture starts to look a bit shiny. Then add the remaining sugar gradually, while whisking all the time, until the mixture becomes really shiny and very stiff. If you perform the whisk trick at this time, the peak will be almost straight up in the air. Finally, whisk in the cornflour for a second or two until smooth. This gives the meringue a marshmallow texture inside with a crisp outside. You can then dollop blobs of the mixture onto each of the 9 circles on the paper and spread each one out to the circle edge with the back of a spoon. You could use a star nozzle in a piping bag and fill it with the meringue mixture. Then, starting in the centre of each circle, holding the piping bag vertically and squeezing it gently as you go, go round and round until the entire circle is filled to give a pretty flat rose shape. When you come to the end of the rose shape, keep the bag moving but stop squeezing it. This will give a neat ‘end’ to the rose. Repeat with the rest of the mix. Bake in the oven for at least 40 minutes. Cool in the oven with the door ajar. I leave them in the oven for a couple of hours to cool them completely. 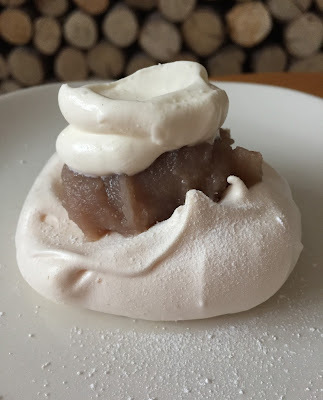 (If your meringues crack or became too brown, just turn the oven down by 10°C or so.) 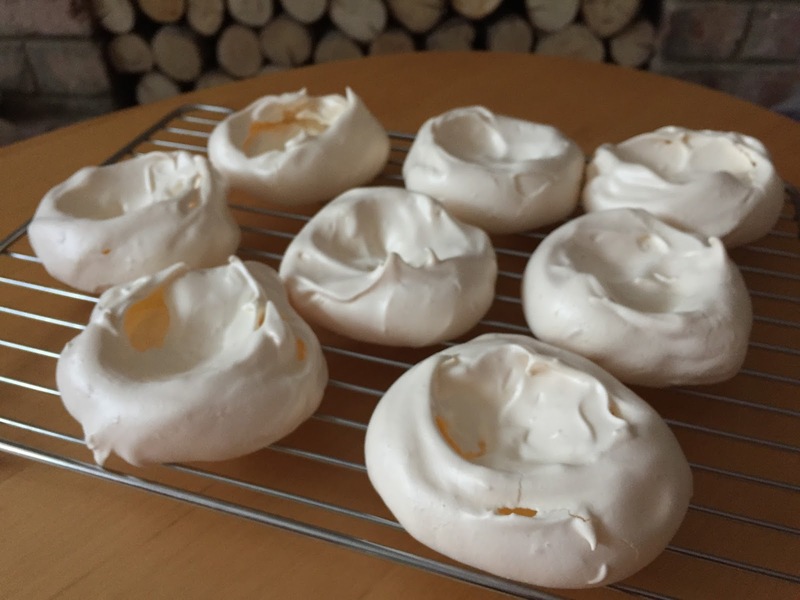 Once the meringues are ready, remove them from the oven. Now, finally the fun bits. Assemble the meringues with the chestnut puree and fresh whipped cream. 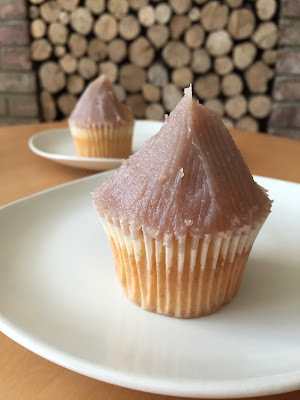 Here is the cupcake version of Mini Mont Blanc. 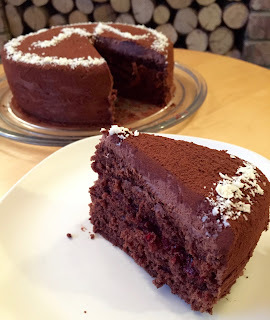 Here is what I decided to call "Chocolate Mousse Cake" as it was actually accidentally made. I was planning to make chocolate cake with dark chocolate ganache for a Birthday cake. However, by mistake, I used almost double the amount of cream and the chocolate ganache ended up like a chocolate milkshake. Hmmmm..... how could I rescue this? So, I decided to whip the chocolate cream to thicken it. And... Voila! It turned out a nice and light chocolate mousse texture. In fact this "chocolate mousse" went very nicely with the light genoese sponge I made. It has a smooth soft texture when made, but it becomes more like truffle when it firms up next day... if you still have any next day. Heat the oven to 180°C (gas mark 4). Lightly grease a 20cm round cake tin and line the base with non-stick baking paper. Alternatively spray the tin with vegetable oil. Whisk the eggs and sugar with an electric mixer until the mixture is pale, fluffy and almost doubled in volume. Sift the flour, cocoa powder and a pinch of salt and use a large metal spoon to carefully fold in the dry ingredients. Pour the vegetable oil carefully from the edge of the bowl and mix all together gently. Tip the mixture gently into the prepared tin and bake for 30 minutes, or until risen and firm to the touch. A skewer inserted into the centre of the cake should come out clean. Set aside to cool. When cold, slice the cake in half and spread the bottom half with jam or chocolate mousse filling. Place the other half on top and pile and decorate with the chocolate mousse filling. Pour the double cream into a bowl and heat in the microwave (2 minutes or so). Remove from the microwave and put the chocolate in the cream to melt. You don’t need to re-heat it as the temperature of the cream should be hot enough to melt the chocolate. Keep stirring until the chocolate has completely melted in the cream. Then cool it down to room temperature. Whisk the chocolate cream mixture until nice and thick. Do not over whisk as it may turn to a buttery spread! 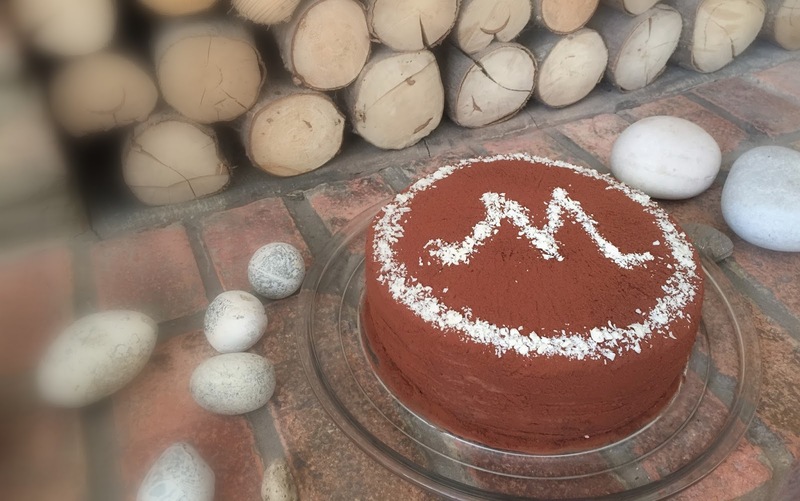 Spread the chocolate mousse over the cake and sprinkle cocoa powder for a matt finish.